Pfizer is striking the Philippines generic industry again. Orient Euro Pharma (OEP) Philippines, a subsidiary of OEP Taiwan recently launched a generic version of olmesartan medoxomil a product for the treatment of hypertension developed by Sankyo but marketed by Pfizer in the Philippines. There is currently no patent for Olmesartan Medoxomil in the Philippines (Sankyo does have a patent application pending that OEP argues does not cover Olmesartan Medoxomil, but Olmesartan Medoxomil in combination with Hydrochlorothiazide). 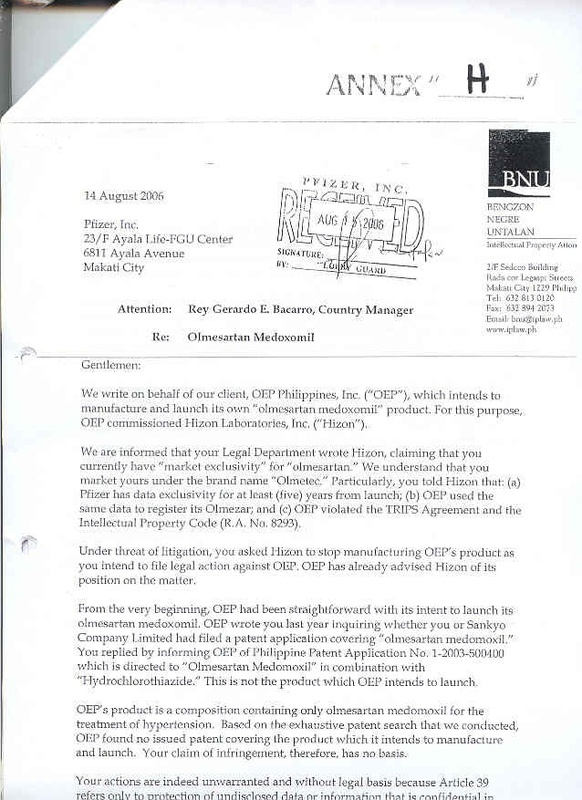 However, this has not stopped Pfizer from threatening OEP and the manufacturer of the product (Hizon Laboratories, Inc.) with legal actions to prevent commercialization of the generic products that have considerably lowered the prices of Olmesartan Medoxomil in the Philippines. Note: 1 USD = 49.5 PHP, all prices are ex-retail prices inclusive of 12% VAT. 1. 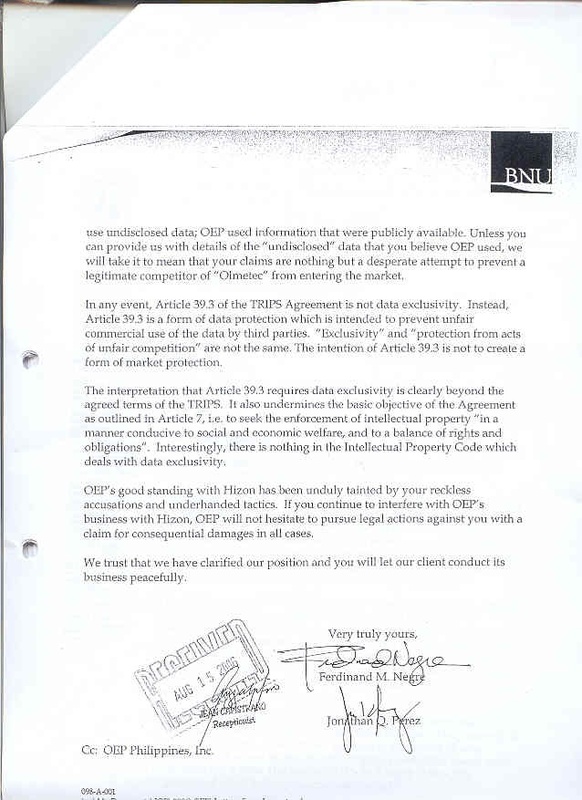 They have 5 years of data exclusivity since Olmetec was launched in the Philippines (January 2005) under article 39.3 of the TRIPS Agreement and the Intellectual Property Code of the Philippines (Republic Act No. 8293). 2. OEP relied on Pfizer’s undisclosed test data to register its generic version. 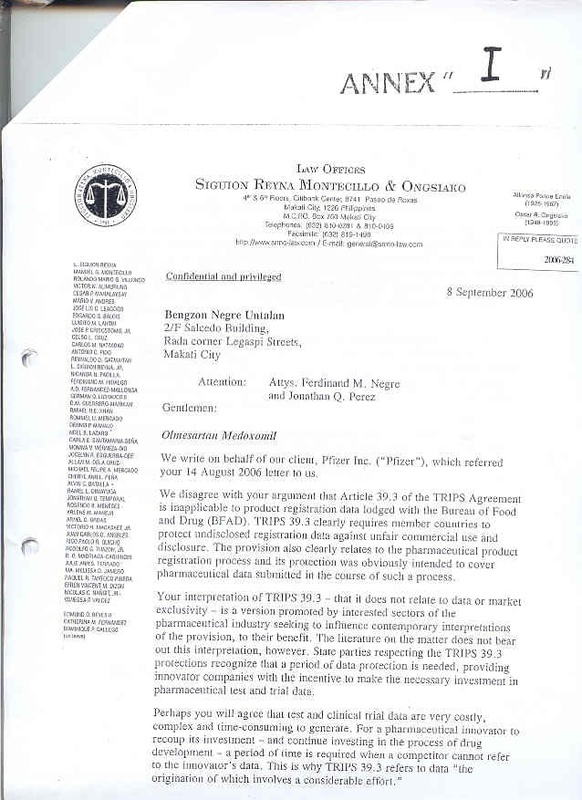 a) Article 39.3 of the TRIPS Agreement is not a self-executing provision upon which Pfizer could sue OEP and Hizon. The correct answer to this question is that it depends. Although Intellectual Property regimes are nation based, international agreements, like the TRIPS Agreement, can have direct effects on nations that have signed them. TRIPS direct applicability depends on the method that the Philippines chose to implement its international obligations and also on the rank given to them. It depends on which legal tradition Philippine’s constitutional law and judicial practice follows: monist or dualist. In brief, for countries following a monist tradition, international law and national law are part of a single legal order; international treaties automatically become integral part of the national law and are self-executing. Monism requires national courts to give effect to international law, notwithstanding inconsistent domestic law, even constitutional law of a constitutional character. Dualists, however, contend that international law and domestic law are distinct and that the status of international law in the domestic system is determined by domestic law. Although there seems to be some controversy, according to Filipino lawyers that I have consulted, the Philippines is a dualist country were international treaties do NOT automatically become integral part of the national law. The legislative and judicial practice is that an enabling law has to be enacted after the Philippines ratify a treaty, because in general treaty provisions are not self-executing. Therefore, OEP claim is correct. Article 39.3 of the TRIPS Agreement only mandates a minimal standard of protection (that does not include data exclusivity as I will explain) and there exists a need for a national legislative enactment on Article 39.3 to give it effect in the Philippines. b) When implementing its obligations under Article 39.3 of the TRIPS Agreements, the Philippines do not have to grant “data/marketing exclusivity” over pharmaceutical test data. This is correct. Article 39.3 only requires WTO Members States to protect from unfair commercial use and sometimes disclosure the pharmaceutical undisclosed test data that originated from new chemical entities, which required considerable effort to generate, and which is required to be submitted to national regulatory authorities to obtain marketing approval. Pfizer is wrong here. Article 39.3 of the TRIPS Agreement does not mandate a data or market exclusivity regime. In fact, only a few countries, the U.S. and the E.U. where brand-name/ originators pharmaceutical companies have an important presence, have traditionally implement its Article 39.3 obligations granting a period of exclusivity to the originator of test data. It is not only academics, civil society and generics companies that defend this interpretation of the TRIPS Agreement. TRIPS negotiating history also does. “Article 39.3, unlike the case of patents, does not require the provision of specific forms of rights. But it does oblige Members to protect undisclosed test or other data against unfair commercial use. It does not create property rights, nor a right to prevent others from relying on the data for the marketing approval of the same product by a third party, or from using the data except where unfair (dishonest) commercial practices are involved. To learn more about pharmaceutical data exclusivity visit CPTech website on the topic. c) OEP also claims that at present, Article 39.3 of the TRIPS Agreement does not have a mirror or counterpart provision under any Philippine law or statute. As explained, the Philippines has to implement the TRIPS Agreement with national regulations to give it effect. My understanding is that the Philippine has implemented its article 39.3 TRIPS obligations with a test data protection regime that does not provide any marketing or data exclusivity, but that provides protection to marketing approval data against unfair commercial use under certain conditions. As the Government of the Philippines reported during 2005 WTO Trade Policy Review, the implementation has been done mainly though the Food, Drug and Cosmetic Act (Republic Act No. 3720) and general business confidentiality regulations. As one Philippino lawyer reported to me, Test Data Protection is enforced in the Philippines through BFAD issuances requiring strict confidentiality of drug applications to prevent unauthorized disclosure and unfair commercial use. “a) Republic Act No. 3720: Prohibits the using by any person to his own advantage, or revealing, other than to the Secretary or officers and employees of the Department or to the courts when relevant in any judicial proceeding under the Act, any information concerning any method or process which as a trade secret is entitled to protection. b) BFAD Order No. 27-A s. 2001 (Confidentiality of Documents): This directs BFAD employees to observe strictly the confidentiality of documents submitted for evaluation and/or registration. c) Revised Penal Code: which penalizes the revelation of secrets by a public officer known to him by reason of his official capacity as well as revelation of industrial secret by private person. d) Republic Act No. 6713 (Code of Conduct and Ethical Standards for Public Officials and Employees): This prohibits the disclosure and/or misuse of confidential information to further their private interest or to the prejudice of the public interest. Republic Act No. 8293 (Intellectual Property Code of the Philippines) includes "protection of undisclosed information" as one of the intellectual property rights”. d) Finally, OEP claims that in obtaining registration for the product they did not have access to any undisclosed test data submitted and they only used information publicly available as well as test data that they generated themselves. For instance, OEP argues that the website of the Center for Drug Evaluation Research and the U.S. Food and Drug Administration contains a wealth of information on olmesartan medoxomil, and that a comprehensive paper entitled “Olmesartan Medoxomil, a Novel Potent Angiotensin II blocker” is downloadable from the internet. In conclusion, there is no regime of test data/marketing exclusivity in the Philippines. The obligation of Article 39.3 of the TRIPS agreement was implemented into the Philippines with a pure test data protection regime that is in compliance with the TRIPS Agreement. 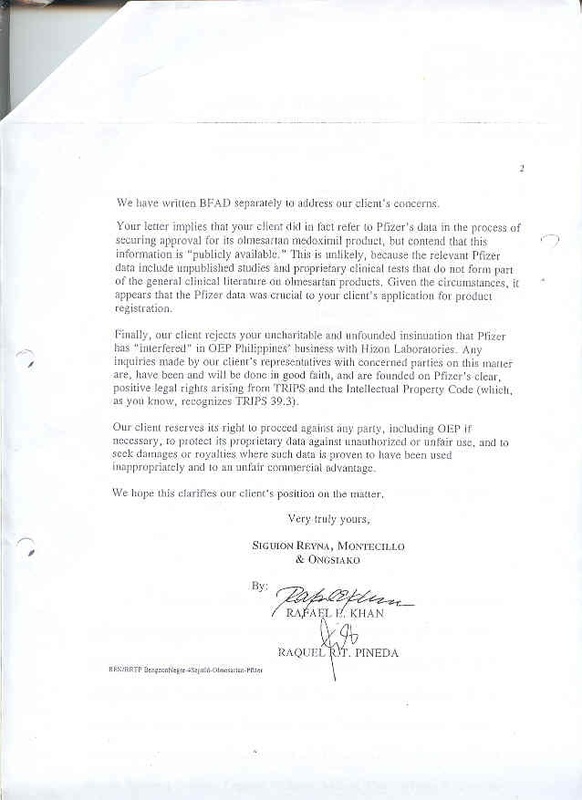 Therefore Pfizer claims that they have 5 years of data exclusivity since Olmetec was launched in the Philippines is a misinterpretation of the current legal regime as mandated by the TRIPS Agreement and implemented in the Philippines and in most of the countries of the world. In 2001 the Philippines government (with other developing countries) was already publically interpreting their legal regime as not providing data exclusivity. - When implementing its obligations under Article 39.3 of the TRIPS Agreements, the Philippines law does not have to grant “data/marketing exclusivity” over pharmaceutical test data and its implementation is with a pure test data protection regime. - If, as OEP claims, in obtaining registration for their products they only used information publicly available as well as test data that they generated themselves, OEP did not violate any of Pfizer’s trade secrets. Judit Rius Sanjuan, James Love, Robert Weissman: "Protection of Pharmaceutical Test Data: A Policy Proposal" (november, 2006). Available here. If you want more information on pharmaceutical test data, visit our website or contact us. Robert L. Joss, Dean of the Stanford Graduate School of Business, answered the Open Letter to Stanford University requesting a public inquiry regarding Dr. McKinnell (ex-Pfizer CEO) fitness to serve the Stanford University Graduate School of Business Advisory Council. I would like to thank you for your letter of September 22 answering the Open Letter to Stanford University of May 18, 2006 signed by Stanford alumni, professors, staff and students, requesting a public inquiry to consider the appropriateness of the continued service of Dr. Henry A. McKinnell on the Stanford University Graduate School of Business Advisory Council. I understand that the Stanford Graduate School of Business invites alumni/ alumnae with important responsibilities to serve on the advisory council on a purely voluntary basis and, as we acknowledged in our Open Letter, Dr. McKinnell, as chairman of the board and chief executive officer of Pfizer Inc., seemed appropriate for such a position. However, the honor to serve Stanford University should only be conferred on those who evidence responsibility and ethical conduct in their professional lives. Dr. McKinnell’s improper use of a legal process and his decision to personally sue government officials to discourage legitimate actions of a developing country makes him inappropriate for such a service and contradicts the school’s mission to “create ideas that deepen and enhance our understanding of management and to develop innovative, principled, and insightful leaders who change the world”. Stanford University and you, as the Dean of the Stanford Graduate School of Business, should reasonably take an interest in the corporate social responsibility and ethical fitness of the members of its governing and advisory bodies. A code of ethics could be an appropriate start. I would like to thank you for taking a personal interest in this case and asking Dr. McKinnell, Pfizer’s ex-CEO, about Pfizer’s lawsuit in the Philippines. Dr. McKinnell has provided an incomplete and misleading explanation of Pfizer's legal actions in the Philippines. Dr. McKinnell writes “…PITC threatened to import generic copies of Norvasc before the patent expires next year….” This does not fully describe either the nature of the dispute, nor Pfizer's response. 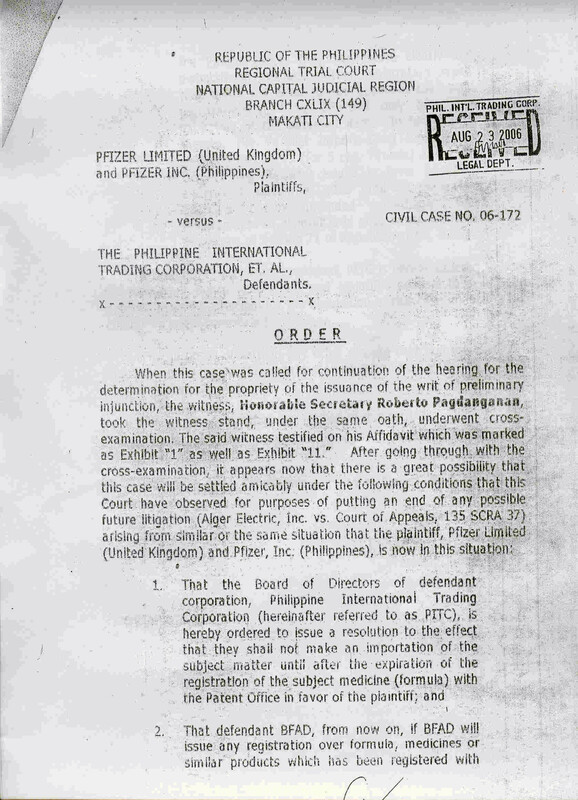 Pfizer’s continuing litigation in the Philippines is not about generics. The Philippines Government only sought to import samples of the drug in order to secure registration, so it could be imported for sale once the patent expired, giving the citizens of the Philippines access to more affordable drugs. This practice, referred to as "early working" of the patent, is widely permitted in developed countries, including the United States, Canada, Australia, and most members of the European Union. Indeed, before the lawsuit, early working was permitted in the Philippines under common law, the approach used by the United States before the US law was changed to provide for a statutory exception to patent rights for this purpose (the "Bolar" amendment). Further, early working of the patent for purposes of drug registration was held to be legal under WTO rules in a 2000 case involving Canada, and is endorsed by the World Health Organization as an important measure to protect consumer interests. Pfizer's response was not only to sue the Philippines to block this common and widely endorsed practice, but to sue two government officials in the Philippines in their personal capacity -- a tactic that is widely seen as intimidation, not only in the Philippines, but across the region. Indeed, as our previous letter indicated, this was the primary complaint against Mr. McKinnell. Mr. McKinnell is fully aware of this, but chose not to respond substantively to this point. Thank you again for taking the time to answer our Open Letter. I remain at your disposal if you require more information. I share your wish that any interested members of the Stanford community should be familiar with the views of all parties here and I therefore encourage you to broadly share this response. Not all are bad news in the Philippines fight for affordable medicines. There is currently an excellent initiative to amend the Philippine Patent Law and incorporate public health flexibilities to promote greater competitiveness in the Philippine pharmaceutical industry and made medicines more affordable and accessible. At CPTech we are following with great interest the work of the Philippine’s Senate Committees on Trade & Commerce and Health & Demography, chaired by Senator Roxas and Senator Cayetano, respectively. On June 7, these two senators filed Committee Report No. 79 containing Senate Bill no. 2263, substituting Senate Bill no. 2139 and which would amend the Intellectual Property Code of the Philippines. On August, 16 2006, Senator Mar Roxas presented a sponsorship Speech. The proposed bill has a title that is worthy to read: “An act to make the laws on patents, tradenames and trademarks more responsive to the health care needs of the Filipino people by clarifying non-patentable inventions, allowing the importation and early development of patented medicines, and modifying government use provisions for drugs or medicines, to lower prices and increase access to and supply of quality drugs or medicines, amending for this purpose certain provisions of Republic Act no. 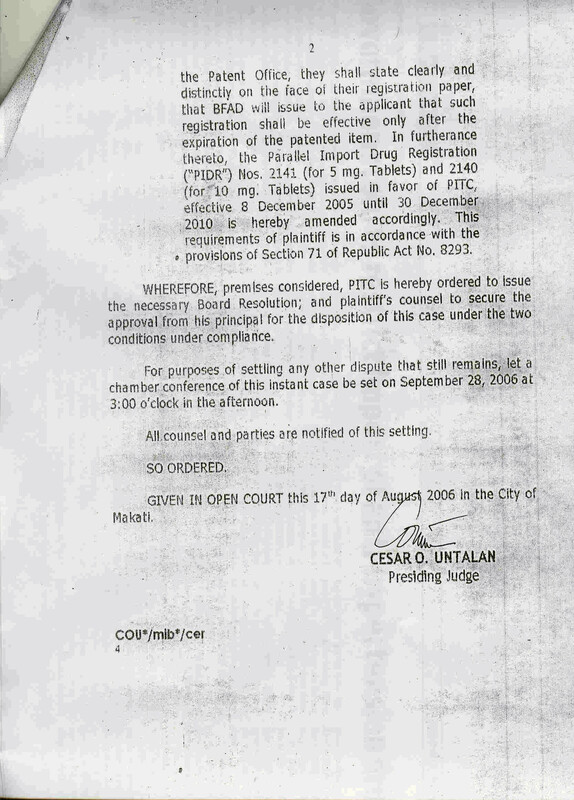 8293 otherwise known as the Intellectual Property Code of the Philippines". a) Following on the example of the Indian Patent Act, exclude from patentability new indications/uses of existing substances that have already been patented. c) Adopting the doctrine of international exhaustion of intellectual property rights that will allow for the parallel importation of patented medicines from third countries. And in order to make the process more easily operationalize, the proposal includes an exception to the application of trademarks and tradename restrictions when applied to parallel imports. d) Amends the conditions for the use of a patented invention by the Government (or third person authorized by the Government) without agreement of the patent owner, to make the process simple and fast. But not everybody is happy with this new turn of the Philippines, as Inside US Trade reported last 4/8/2006, the Pharmaceutical Research and Manufacturers of America (PhRMA) opposes proposed Filipino patent law amendments and in that sense is pressuring Adrian Cristobal, Director General of the Intellectual Property Office of the Philippines. There are changes in the Pfizer litigation I reported some months ago. The Philippine court dealing with the case released a settlement order (available here and here). At CPtech we have studied the settlement proposal and I would like to share with you our analysis. The paragraph 2 of the order, aims to introduce linkage of patent and health registration in the Philippines, although a 2005 Department of Health Administrative Order, clearly stated the Government of the Philippines intentions not to accept linkage. What is linkage? Patent-Registration Linkage is the practice of linking drug marketing approval to the patent status of the originator’s product and not allowing the grant of marketing approval to any third party prior to the expiration of the patent term unless by consent of the patent owner. This practice requires that "second applicants" for marketing approval (usually generics) demonstrate that the pharmaceutical product for which they are applying is not protected by a valid patent. Under this kind of regulation, national regulatory authorities have the obligation to prevent the registration and marketing of a generic pharmaceutical when a patent covers the product. The use of linkage is subject to several critiques, the most important is that linkage creates many problems if the national patent office grants low quality patents. If linkage is introduced in the Philippines through this settlement, Pfizer is the clear winner in this litigation and will force the Philippine health administration to act as a patent police. While trying to contact Pfizer's Chairman and CEO (Dr. Henry McKinnell) on the Philippines litigation, we realized he is a Stanford alumnus and member of the Stanford University Graduate School of Business Advisory Council. And not only that, he has been honored by the business school for his "leadership"
As students, alumni, professors and staff of Stanford University, we are writing to request a public inquiry to consider the appropriateness of the continued service of Dr. Henry A. McKinnell on the Stanford University Graduate School of Business Advisory Council. As chairman of the board and chief executive officer of Pfizer Inc, Dr. McKinnell is undoubtedly among the most successful graduates of Stanford Business School. But, in that capacity, he is also responsible for improperly using a legal process to discourage appropriate government actions and an appalling bullying of government officials in the Philippines. Pfizer has sued both the government and two top drug regulators in their personal capacity for taking very modest steps to help the poor find less expensive sources of a Pfizer medicine -- (amlodipine besylate, an important blood pressure drug, which is marketed in the U.S. under the trade name Norvasc) -- after the patent on the drug expires. It would be one thing for Pfizer to engage in lobbying activity or even litigation seeking to clarify its rights under Philippine Law. But to sue the top drug regulators in the Philippines in their personal capacities is an extraordinary act of intimidation. The chilling effect of this litigation is evident in the Philippines, as many government officials will now hesitate to take any measures contrary to Pfizer's interests. We believe that Pfizer’s actions, for which Dr. McKinnell is responsible for his official capacity, belie values and motives that are in stark contrast with the lofty aspirations of Stanford University and its School of Business. The mission of the Stanford Graduate School of Business Advisory Council  is "to provide external perspective and review as well as advocacy and support for the School's programs, strategic direction, and overall objectives". The School's mission  is "to create ideas that deepen and enhance the understanding of management, and with these ideas develop innovative, principled, and insightful leaders who change the world." The core values are also clear: "believing in the power of ideas and intellect; striving for excellence in all we do; acting with integrity; exhibiting compassion and respect for others; and taking ownership of one's actions". Dr. McKinnell's actions, on behalf of his corporation, reflect poorly on Stanford and are grossly inconsistent with the school's mission. Their seeming purpose and effect is to emasculate and intimidate the poor and the powerless. Therefore, we believe that the University should undertake a public inquiry to consider whether these inconsistencies render Dr. McKinnell unfit to serve on the Stanford University Graduate School of Business Advisory Council.